See Water Feature Place Names for names and location of current and historical water features in California. Guide to USGS Geologic and Hydrologic Maps (Andriot) 1992 (Abstract Docs QE 77 G85) Includes subject, area and geographic coordinate indexes. Publications Warehouse (US Geological Survey) Indexes over 1500 geologic and hydrologic maps covering California. Includes links to online fulltext if available. California (Nationalatlas.gov) Shows major California rivers and lakes. California Groundwater Aquifers (Google Earth Library) Available as a Google Earth KML layer. Source data is from the California Department of Water Resources. California State Water Project Atlas (California Department of Water Resources) 1999 (atlas TC 424 C2 C3 1999) Describes major features of the State Water Project using text, maps and illustrations. California Waterfalls - Nevada Waterfalls (Geology.com) Uses a Google Maps interface to plot major waterfalls in California and Nevada. Also includes a table giving geographic coordinates and USGS topographic quadrangle. California Water Atlas (Kahrl) 1979 (print copies available in atlas folio G 1526 C3 C3 1979 and Cal Docs P 580 W 38 folio) Provides a comprehensive introduction through text, maps and graphics to water in California from the advent of European settlement to the mid 1970's. The atlas covers water as a natural resource and its utilization and development in California. Prepared by the Governor's Office of Planning and Research and the California Department of Water Resources. California Watershed Browser (California Watershed Council) Users drill down through a map of California's watersheds using the CalWater geographic dataset. Once an area of interest is identified, the user can retrieve digital orthophoto quads; scanned USGS map sheets for the area; watershed projects from the Natural Resources Project database; and a list of rare species and natural communities inventoried by Fish and Game’s Natural Diversity Data Base. Callifornia Watersheds (California Interagency Watershed Mapping Committee) Generated from the CalWater gis dataset. California's Major Water Projects (California Department of Water Resources) 2005. Map within the California Water Plan Update that maps state, federal and private water projects. CALWATER: a Standardized Set of Watersheds (California Dept. of Forestry and Fire Protection, Fire and Resource Assessment Program) Generated from the CalWater 2.2 dataset. EnviroMapper for Water (US Environmental Protection Agency) Interactive mapper includes data layers for watersheds, water quality and water pollution. eWRIMS (Electronic Water Rights Information Management System) Web Mapping Application (California State Water Resources Control Board) Database and interactive mapping application that queries and maps information on water right permits and licenses that have been issued by the State Water Resources Control Board and its predecessors. 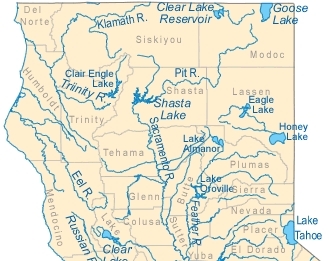 Facilities in state: California (US Bureau of Reclamation) Statewide map of dams operated by the US Bureau of Reclamation with links to projects, powerplants and dams. Ground Water Atlas of the United States: California, Nevada (US Geological Survey) 1995 (print copy available in Docs I 19.89:730B) Describes the location, extent, geologic and hydrologic characteristics of important aquifers in California. Hydrologic Unit Map--1978, State of California (U.S. Geological Survey) 1978 (print copy available in Docs I 19.89/1 C12) 1:500,000 scale map of USGS hydologic units in California..
Pacific Coastal Watersheds (US National Ocean Service. 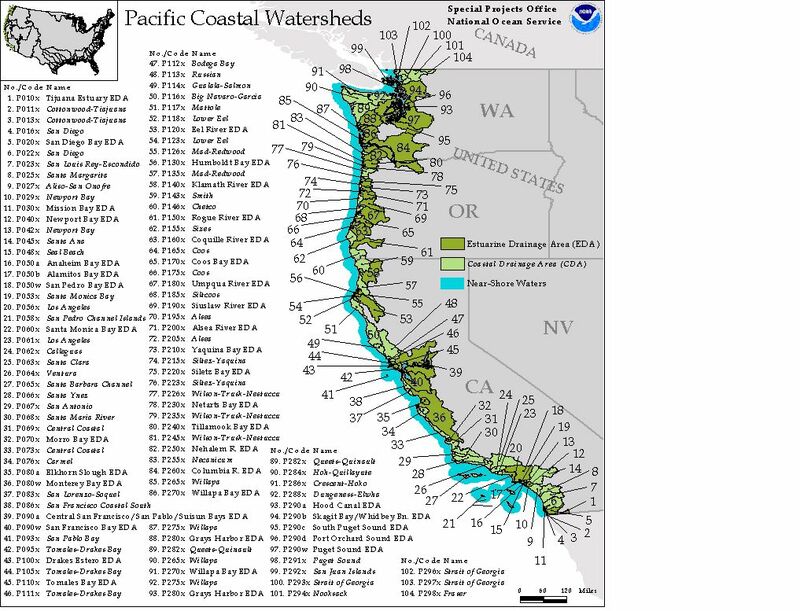 Special Projects Office) Maps watersheds included in the Coastal Assessment and Data Synthesis System (CA&DS). Water Resources of California: Streams, Lakes and Reserviors (US Geological Survey) Simliar maps show shaded relief and average annual precipitation 1961-1990. WaterWatch--Current Water Resources Conditions: California (US Geological Survey) Series of maps that graphically show streamflow conditions in California. Maps are updated daily or more frequently. Individual maps show real-time streamflow compared to historical streamflow, flood and high flow conditions, daily streamflow compared to historical streamflow, 7-day average streamflow compared to historical streamflow, below normal 7-day average streamflow compared to historical streamflow, and drought watch. Mouse-over any of the 200+ recording sites to get detailed site information.